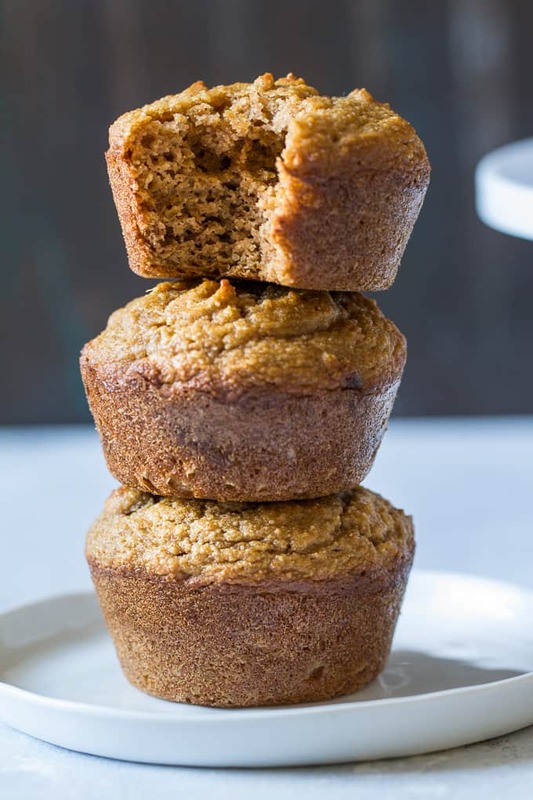 These moist and soft cinnamon raisin sweet potato muffins are grain free and Paleo, perfect with breakfast or as a snack, and very kid friendly! 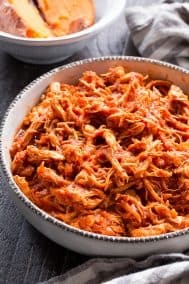 Sure to become a family favorite you’ll make again and again. 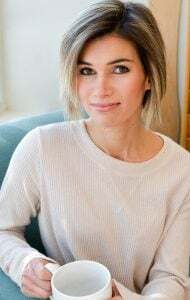 How’s it going everyone? I know what you may be thinking. I tortured you with chocolate yesterday, promised more of it (it’s coming, no doubt!) 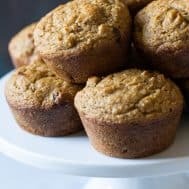 and now I’m sharing a super wholesome (hidden-veggie-wholesome) muffin recipe with not an ounce of chocolate in sight. Or maybe you’re not thinking that at all. 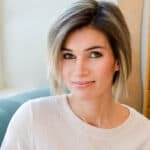 Maybe you’re just happy to see a classic, everyone-will-like-this baking recipe that’s PROOF that this whole Paleo thing might actually work for you in the long term. Or at least for the next 2 hours before the muffins are completely gone. That was code for “these-are-so-good-everyone-will-want-2. At least. But anyway, just so you know, I did not break my Whole30 “rules” to make these sweet potato muffins, nor did I make these at 12am this morning (I definitely do not work well under pressure.) Nope, I actually made not just one, but TWO muffin recipes way back in December, prior to my Whole30, just to be “ready” to go full-force with baking recipes once the month of January was over. Which it is, and wow – it went fast! 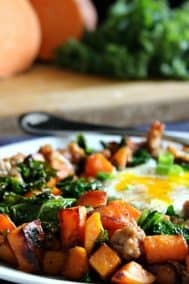 I’m not sure I even feel “ready” for the Whole30 to be over – weird, right?! 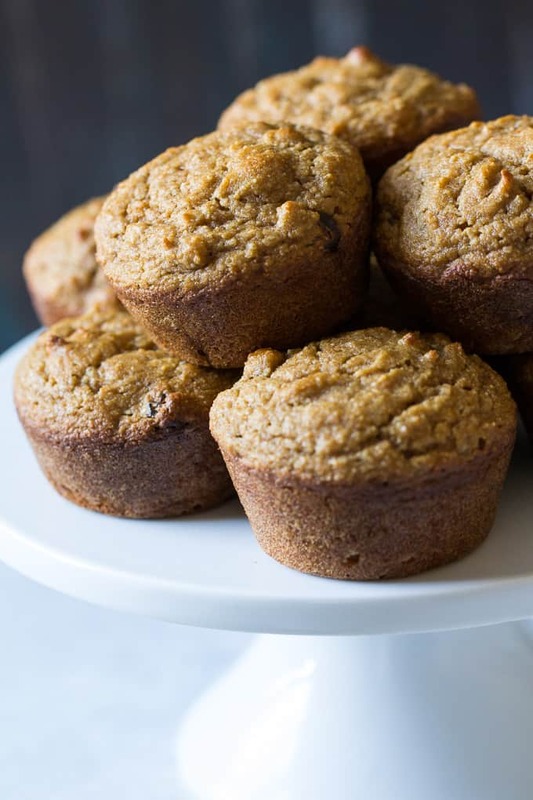 These muffins actually go way back to Thanksgiving Day, when I decided last minute that in addition to my pumpkin bread, I needed another “sweet” bread recipe to make sure I succeeded in making WAY too much food. On Thanksgiving, if you don’t make enough food to feed at least twice the crowd you actually have, it simply isn’t enough. Or so I’ve decided over the years. 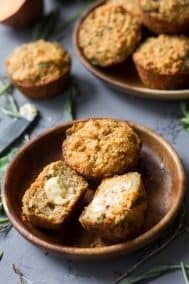 So, I wound up throwing these together as a “sweet” version of my savory herbed sweet potato muffins, and, not surprisingly they wound up being a favorite. Since November, I’ve made them twice more for the family and they come out perfectly every time. I added raisins this time around, but I’ve also used cranberries to make them holiday-ready (which was the original big hit.) You can also do chocolate chips, or simply go “naked” as some pickier-children-who-won’t-be-named seem to prefer. 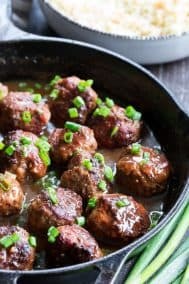 Own the recipe and make it your own, I know you guys will love this one! Let’s get started! 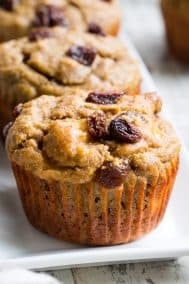 Perfectly healthy and delicious cinnamon raisin sweet potato muffins that are great for breakfast or a snack, and kids will love them! 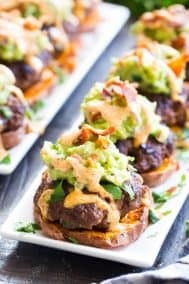 They're grain free, dairy free, Paleo and have "hidden" veggies - sweet potato! Preheat your oven to 350 degrees and prepare muffin pan by lightly greasing with coconut oil, or lining with muffin liners. Combine the dry ingredients in a separate bowl, then stir into the wet mixture until just moistened, don't over-mix. Stir in raisins, then transfer all the mixture evenly in the muffin pan (I made 10 larger muffins but you can also make 11-12 smaller ones. Bake for 20 minutes in the preheated oven or until a toothpick inserted in the center of one comes out clean. Allow to cool for a minute in the muffin pan before transferring to a wire rack to cool completely. Store any leftovers covered in the refrigerator. Enjoy! 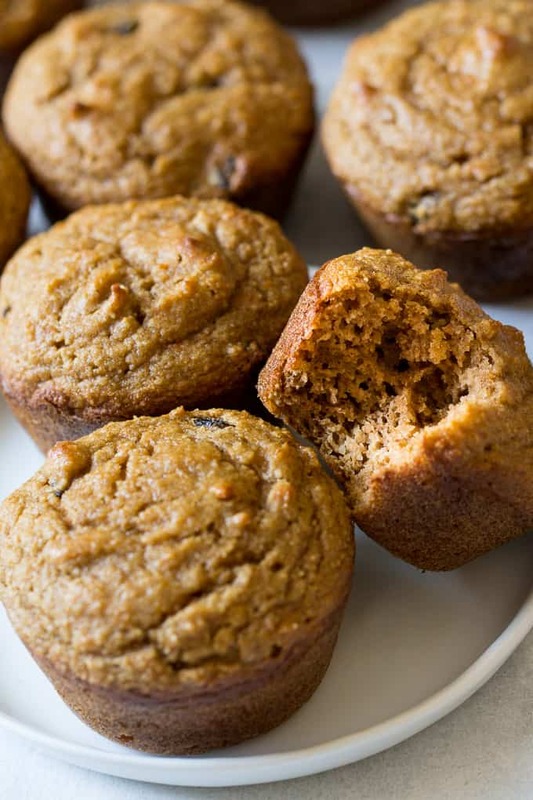 Cinnamon Raisin Sweet Potato Muffins made #grainfree #Paleo and kid friendly! 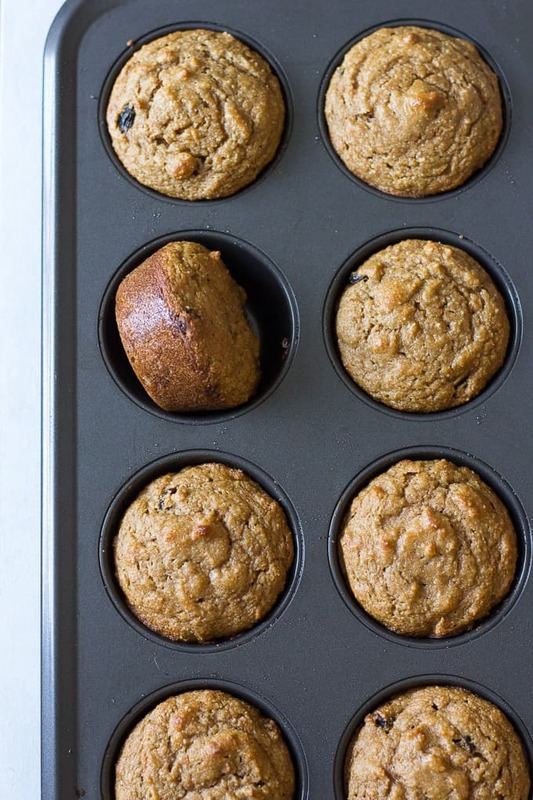 Want more Paleo muffin recipes? Try one of these! 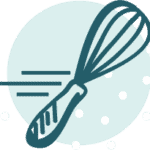 What do you feel like baking lately? Let’s talk muffin size – mini, standard, or jumbo? It has been far too long since I baked with sweet potato, Mission for the weekend! We love cinnamon raison bread so these sound so delicious! Can’t wait to try them! WOW these are so fluffy looking; must make muffins today. I’ve never seen such a short ingredients list for a paleo muffin. I like a jumbo muffin – like a big chocolate chip one from dunkin donuts! although I see baked by Melissa now has little mini muffins like their cupcakes! Just what I been looking for! I think I may try these tomorrow morning for breakfast. While I do appreciate a picture or two of delicious recipes, does anyone else find it really necessary to have 7+ photos of the same muffins? I find it tiresome to wade through so many pictures. Ah, sorry about so many photos. I will take that into consideration and cut it down to 4! I have a GF flour mix. Can I replace the 3 flours in this recipe with my all purpose mix? I don’t think the exact amount would work since each flour is different, specifically the coconut flour is very dense and a little goes a long way. I think you’d need to increase the amount of GF flour by 1/2 cup or so, but again I’m not sure! Okay, I made them this morning. They were quite delicious! I might have added more cinnamon, though. The texture was great, and the raisins gave it a good amount of sweetness. Glad you liked them! Maybe a tbsp of cinnamon next time. I made these yesterday. YUMMY! My husband does not care for super sweet stuff, so these were just right for him. What can you sub the tapioca flour with? Almond or Coconut? I am doing Whole30. Could you omit the Maple syrup? My husband doesn’t care for sweet potato at all (imagine! ), but he loves cinnamon and raisins. 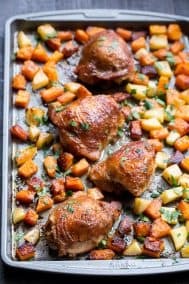 Could I substitute apple sauce or something like that instead of the sweet potato? We can’t have nuts. 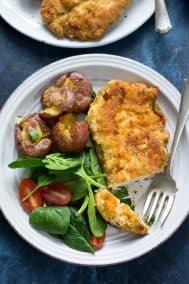 Would buckwheat flour work in this recipe? These were awesome! 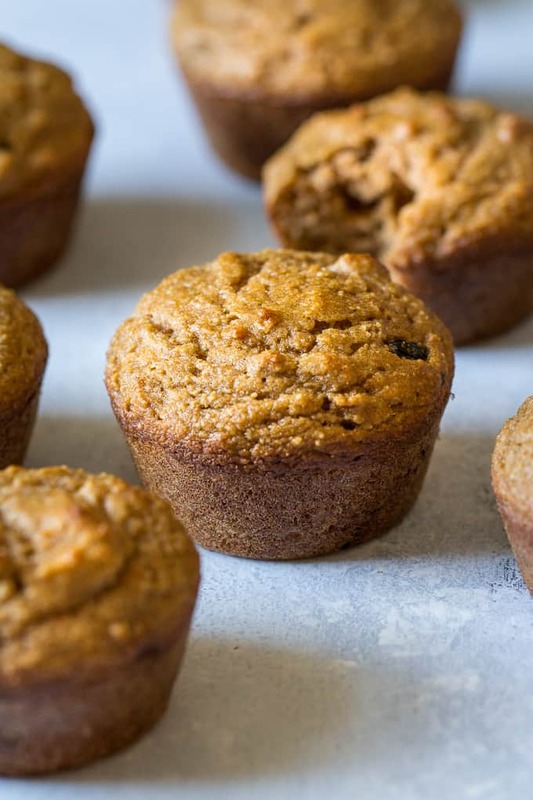 Reminded me of a delicious raisin bran muffin…my hubby, baby, preschooler and I all devoured them! I used honey instead of maple syrup only because I ran out and they were super yummy! These are so delicious!! Highly recommend! My coworker who isn’t a huge almond flour fan LOVED them. They have this amazing buttery taste but there is no butter! Yummy!